American Bobtails are very loyal and devoted to their owners. They will follow you around, ask for attention and make them self at home on your lap whenever they get the chance. They are a very intelligent breed and are great escape artists. They need to be mentally and physically stimulated as much as possible. Puzzle games, learning tricks and leash training are all things American Bobtails are very receptive to. This breed of cat is also a very good traveler, making them a favorite of truck drivers. Generally, they are not a very vocal breed, but do have their own distinctive chirps and trills they use when feeling happy and content. Both pure-bred and mixed-breed cats have varying kinds of health problems that may be either influenced by genetics or environmental factors. 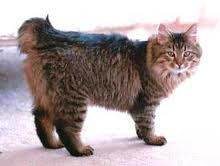 The American Bobtail is generally a healthy breed due to the large amount of feral bloodlines in their breeding history. Although rare, the tail-less American Bobtails could suffer from spinal or neurological issues due to the fact that they do not have any tail. This could lead to problems that affect their ability to control defecation.